Access control doesn't have to be complicated or expensive. It does not always require an electrical or Ethernet power source to provide your business with great access control for staff and visitors. If you need to control who has access to anything from a cupboard to a steel exterior gate then read on because here are some questions that will help you decide what type of access control you really need. 1. 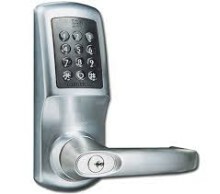 What are you trying to control access to....cupboard, locker, store room, exterior door, car park or gate? 2. What type of door and how many doors do you need the lock for.....Wood, metal or glass? 3. How much traffic will the lock have daily......light, medium or heavy use? 4. What type of codelock do you need.....mechanical or electronic and do you need an audit trail or timed access? 5. Is the code lock stand alone or in addition to another lock? 6. Who will be using the lock....staff and or public? 7. Do you need to change the code regularly? 8. What type of access do you need....push button only, card / fob, bluetooth or timed? 9. How many people will need access to each lock? 10. Do you need a key override?